Used For: The remedy is applied for boosting perspiration and expectoration, stimulating the organism, fighting diarrhea, and inducing urination. It also acts as an antiseptic. Birthroot is believed to reduce bronchial conditions, bloody coughs and common coughs, lung weakness, and diarrhea (particularly when consumed with milk). Additionally the herb is applied for female reproductive system conditions, both topically and orally. To treat insect bites the plant is applied externally in form of poultice. In the early times of America it was used to help a woman in labor. Additional Info: Birthroot belongs to perennials. 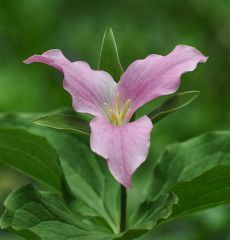 It grows in shadowy forests on rich soils in the western and central areas of the USA. The stem reaches only 10-15 inches high, and it grows from a long rhizome. The leaves can be found on the top of the stem. The blossoming period is commonly at the end of spring and the beginning of summer, when one can see yellow or red-white flowers. Preparation and Intake: To make a decoction, take 1 teaspoon of root extract for a cup of water. Consumed both cold and warm before night sleep. The daily dose is 1-2 cups. In form of tincture the remedy is applied in a dose of ¼-1/2 teaspoon a time.